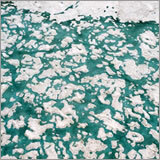 It all started in a café, showing fellow artist, Mary Rosengren, photographs of a glacier in Chile. "You should apply to the Polar Arts Programme (www.theme.com.au) - I am!" she said. So I did. And flew, a few months later, to the port of Ushuaia, to board Kapitan Khlebnikov for a semi-circumnavigation of the Antarctic continent. Overwhelmed by superlatives it was difficult to describe the passing vistas with jaw dropped on deck. 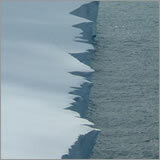 Everything seemed paper like; ripped edges of ice cliff and crevasse lines of writing. We made mini-landing books, customized postcards and bound itineraries. I was besotted. For weeks afterward I dreamt of the ice or couldn’t sleep at all, pouring over diagrams in a textbook of Physical Geography and experimenting with paper/ice structures. I have been trying to bind icebergs out of paper ever since. 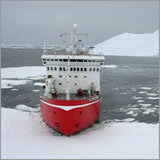 The SAC supported the resulting exhibition – Ice Bound: Antarctic Bookworks at Casa Luna gallery in Amsterdam. ‘Lightberg’ was a particular success, wooing passers by as it floated in the dark. In a thwarted attempt to progress my application to the British Antarctic Survey’s Artists and Writers Programme, I visited Cambridge but was instead recruited to the Education and Outreach Committee for International Polar Year, as the ‘Art/Science bridge’! In the course of constructing fantastical plans to mount and exhibition of land art made exclusively from snow and ice, the Antarctic Treaty Consultative Meeting (ATCM) was held in Edinburgh. Having realised that my land art dream was ethically and logistically impossible, I was excited to hear about a new career option; a season at Port Lockroy. That year that job was not to be mine, however, so I cast about in desperation to return South. During the ATCM, HMS Endurance had been moored at Leith, as a nominal delegate I was invited aboard (and photographed in one of their Lynx helicopters.) After impressive winching manoeuvres, a cup of tea and some explanation about what exactly a travelling bookbinder does, I waved them farewell, but later wrote to the Captain proposing a residency. He agreed. The flight from Brize Norton, Oxfordshire to Mount Pleasant, on the Falkland Islands, was my introduction to military life and a very different, though just as extraordinary, second voyage to the Ice. A month of workshops, knots and acrostics punctuated my watch on bridge and monkey deck, accompanied by camera and notebook at all times. We stopped at Port Lockroy for an hour or so. I had the strangest sensation of not needing to take many photographs, and humped a heavy bag of post back to the ship. 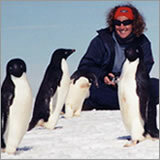 At the second attempt, I was offered the position as Assistant Post Mistress and Penguin Monitor, and spent five months at Port Lockroy, looking not making, welcoming 18,000 visitors and franking nearly 80,000 stamps. A solo show is planned for the Spring of 2009.